Although Randy only had one kidney, life was pretty normal for him until 2005. That’s when his nephrologist, Dwayne Bergeaux, MD, medical director of DCI Jennings, said something needed to change in his lifestyle if he wanted to avoid dialysis. Dr. Bergeaux recommended gastric bypass surgery to help Randy expedite his weight loss, which would enable Randy to regain some kidney function. “He told me I needed to lose weight or I would need to begin dialysis within the year,” Randy said. Randy knew he didn’t want dialysis, but he told Dr. Bergeaux the only way he would move forward with the surgery was if his wife, Laurie, did too. Later that year, both Randy and Laurie underwent gastric bypass surgery, which enabled Randy to maintain his kidney health for nearly 11 more years. educational opportunities to learn more about the risks and benefits of this treatment option. She referred herself to a transplant center and soon learned that in Louisiana, a kidney transplant must be done within the state to be covered by her insurance. She went to Tulane Medical Center and began meeting with a transplant coordinator to learn more about Randy’s options. In October of 2015, Randy began home peritoneal dialysis after training at DCI Jennings. Life on dialysis was hard for Randy and Laurie. Randy had to learn how to keep detailed treatment records, and since peritoneal dialysis requires a sterile environment with no pets, Randy had to dialyze in a separate, “no-dog” room at night. With dialysis, Randy and Laurie also learned that there are a lot of restrictions on diet, causing Randy’s weight to drop significantly. “Life on dialysis was completely different. He was so tired, he was always trying to catch up on his sleep,” she said. During this time, Randy continued to work. As a cook at the Southwest Louisiana War Veterans Home, his employer provided a sterile room for him to dialyze in at work if the need arose. About three months after he began dialysis, Randy became a transplant candidate and 19 friends and family members stepped up to see if they were a match for him. Of those, five were viable, and on January 27, 2016, Randy’s younger sister was scheduled to donate her kidney to him. Unfortunately, Randy caught a cold and the transplant had to be delayed about two more weeks. But finally, on February 17, 2016, Randy’s sister became his living organ donor. 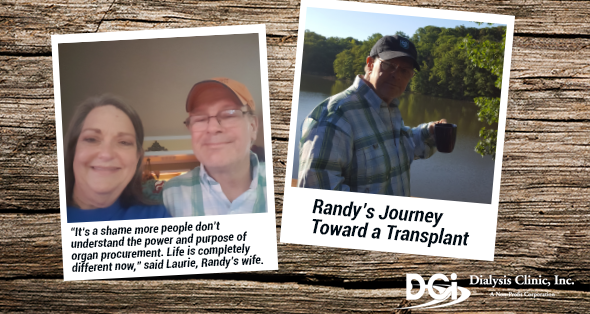 Laurie said that even though they had to make sacrifices along the way, Randy’s kidney transplant made it all worth it in the long run. “At one point, Randy didn’t know if he would live to be past 50. He’ll be 60 in October and he feels amazing. He might outlive my dad who’s 90!” Laurie teased.